CREDIT CARD GIANT Visa has joined investors putting their money into digital payments company Stripe, which was founded in 2010 by Limerick’s Collison brothers. The latest fundraising round values the company at $5 billion (€4.5 billion) – up from a $3.5 billion pricetag put on it less than eight months ago. Stripe provides back-end payments infrastructure so that businesses from startups to global tech firms can easily take customers’ money online. Rather than having to design custom payments forms, companies can plug in its pre-made forms to websites and mobile apps. In return it takes up to 2.9% of the charges it processes plus a 30c charge per transaction. The San Francisco-based company’s customers include Twitter, which it partnered with to put a “buy” button in tweets, crowdfunding site Kickstarter and Shopify, among others. While the exact amount of the latest investment hasn’t been revealed, the New York Times reported it was “less than $100 million (€90 million)”. By pairing with Visa, Stripe will be able to make the most of the company’s security know-how and its worldwide reach. Its full services are currently available in nine countries including Ireland, while it is operating in beta in another 11 markets. Stripe previously took investment from American Express and has also partnered with the credit card company for its fast online payments system. CEO and co-founder Patrick Collison told Recode that the card networks were “blindingly obvious people to work with” if the company’s goal was to increase the value of internet transactions and speed up its global roll-out. Collison and his brother John sold their first company, Shuppa, to Canadian firm Live Current Media for $5 million in 2008 when the pair were both still in their late teens. 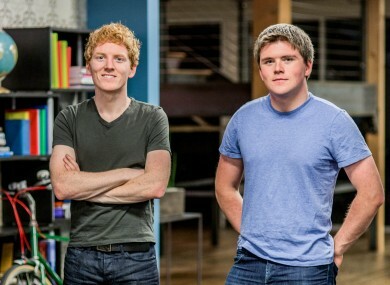 Both had been in college in the US before dropping out to launch Stripe. Email “The payments startup founded by two Irish brothers now worth a staggering $5 billion”. Feedback on “The payments startup founded by two Irish brothers now worth a staggering $5 billion”.